For weeks now, Project Connect (with public tax money) has been carrying out a “saturation bombing” ad campaign promoting its $1.4 billion urban rail plan, primarily aimed at bolstering development plans and centered on the interests of private developers and the East Campus expansion appetites of the University of Texas administration. It’s a “Pinocchio-style” campaign (and plan) packed with exaggerations contrived to try to sucker voter support. Perhaps the worst problem is the “city-wide system” deception that Project Connect is pushing in its ad blitz — the make-believe that an urban rail line on East Riverside through the East Campus to Highland will lead to rail in other parts of the city. In fact, just the opposite will happen. The staggering cost will soak up available local funding for years to come — and that in itself will impede future rail transit development. The “Elephant in the Road” — a vote for Project Connect’s Highland-Riverside “urban rail” project is also a vote for a bus project on Guadalupe-Lamar that will block urban rail where it’s most needed. Image: ARN library. Graphic excerpted from Project Connect’s ad blitz currently running on local TV outlets. Graphic: Screenshot. For months, Project Connect (with public tax-based funding largely funneled through Capital Metro) has been conducting an ad blitz with the clear de facto objective of soliciting voters’ support for the widely discussed urban rail bond funding measure expected to be placed on the ballot this coming November. Within the last couple of weeks, this political ad campaign has been expanded to include television advertising and, this past Friday (July 11th), a front-page ad in the Austin American Statesman. 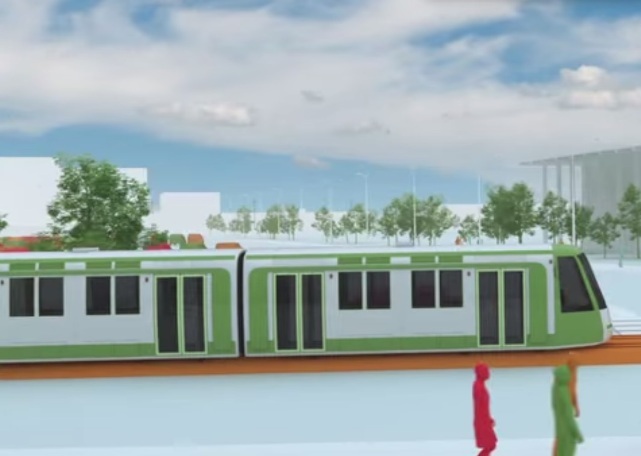 For example, here’s one of Project Connect’s 30-second TV commercials, titled Learn more about Project Connect: Urban Rail. 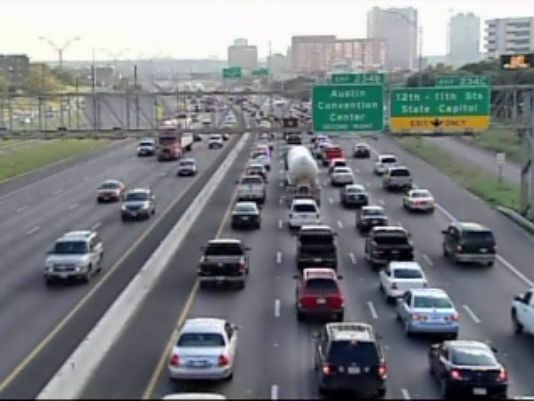 110 people a day move to Central Texas, making Austin traffic even worse. But urban rail could help. The newest proposal from Project Connect, urban rail will arrive every 10 to 15 minutes, seven days a week and feature 16 stations and four park & rides. It will connect the Convention Center, downtown businesses, entertainment areas, the new medical school, UT, and lots of neighborhoods, and would be part of a growing system with connections to bus and commuter rail. 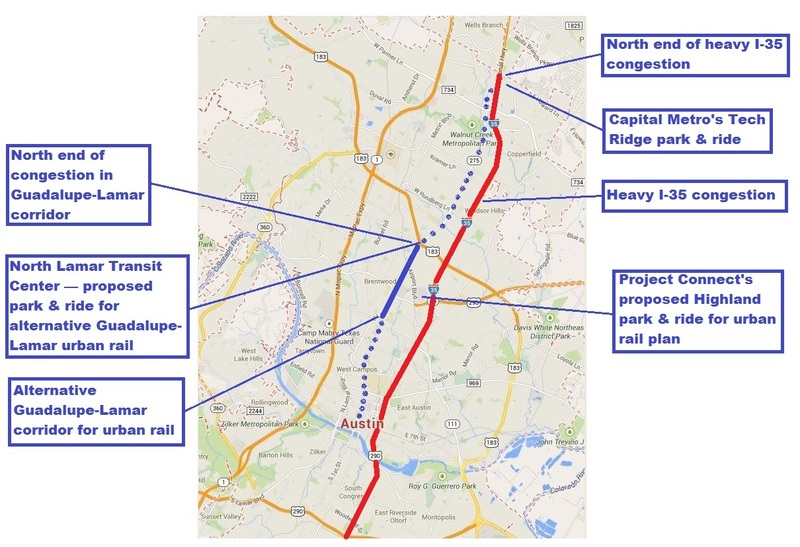 As usual, Project Connect blithely bulldozes forward, willing to discard the decades of work and tens of millions of dollars that have been invested in identifying the Guadalupe-Lamar corridor as the pre-eminent candidate for Austin’s urban rail starter line. They continue to ignore the widespread barrage of community bafflement, criticism, and anger provoked by their arrogant, “damn-the-torpedoes” Blitzkrieg, aimed at rewarding real estate developer interests and the UT administration’s East Campus expansion aims, instead of addressing the true mobility needs of the Austin community. Sec. 255.003. UNLAWFUL USE OF PUBLIC FUNDS FOR POLITICAL ADVERTISING. (a) An officer or employee of a political subdivision may not knowingly spend or authorize the spending of public funds for political advertising. (b) Subsection (a) does not apply to a communication that factually describes the purposes of a measure if the communication does not advocate passage or defeat of the measure. (2) is sufficiently substantial and important as to be reasonably likely to influence a voter to vote for or against the measure. (c) A person who violates Subsection (a) or (b-1) commits an offense. An offense under this section is a Class A misdemeanor. (e) On written request of the governing body of a political subdivision that has ordered an election on a measure, the commission shall prepare an advance written advisory opinion as to whether a particular communication relating to the measure does or does not comply with this section. Project Connect’s aggressive political campaigning — using taxpayers’ money to try to persuade voters to approve more taxpayer money to finance the highly controversial (and, in the view of many, flawed and wasteful) urban rail proposal — has disturbed and outraged many citizens within the Austin community. 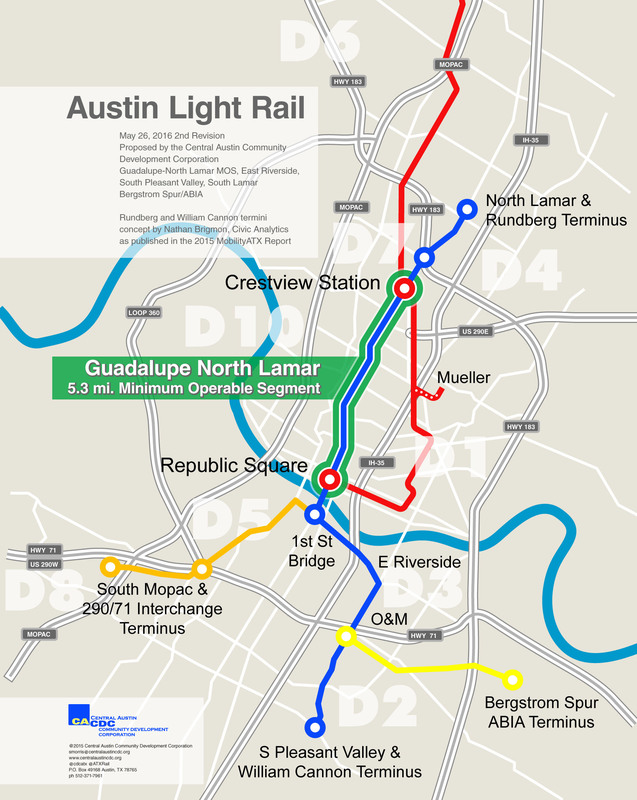 On July 11th, Austinites for United Rail Action (AURA) — a group mainly composed of young professionals that support urban rail but dislike Project Connect’s proposal — issued a public statement, addressed to the the Capital Metro board and titled “AURA Questions the Project Connect Marketing Campaign“. As you know, Project Connect has been running — and continues to run — an aggressive marketing campaign on behalf of your policy efforts. While some advertisements seem intended to convey basic information, others (such as the radio campaign) seem like political advocacy on behalf of the Regional Mobility Plan’s controversial recommendations. As taxpayers and transit advocates, we are concerned about the expenditure of public money for this campaign-related advertising. While the words “vote for the bond package” are not included in any of the advertisements, this sort of technicality prioritizes form over substance: since the rest of the content makes no mention of opposing viewpoints or data, this advertising campaign is public relations, not genuine engagement. 1. What entity is paying for existing Project Connect-related advertising? 2. How large is the purchase and how long will it last? 3. Who determines the content and themes featured in the advertising? 4. What standards has the Board provided to ensure that advertisements do not cross over into advocacy and remain firmly within the engagement realm? Thank you for your attention to the matter. While Austinites may disagree on the best path forward for transit, we all agree that using taxpayer funds for political campaigning is unethical. While these questions deserve answers, Austin Rail Now fully expects that AURA’s objections will be met with claims by Capital Metro and Project Connect that, by their own interpretation, no laws are being violated by the ad campaign. But it’s one thing to split legal hairs over legal violations, and quite another to commit a breach of faith and violate public trust over such a fractious and contentious issue. The alibi that this is merely an “educational” campaign is evidently intended for (1) the Project Connect faithful and (2) the hopelessly stupid. And, by heavily investing tax dollars in commercial media advertising buys to advance this ballot measure, is Project Connect attempting to cultivate friendly media attention and treatment? I-35 is the most congested roadway in Texas. But is this really the main travel corridor for commuters from “Highland-Riverside” neighborhoods to the Core Area? And would Project Connect’s proposed urban rail line have any perceptible impact? Photo source: KVUE-TV. 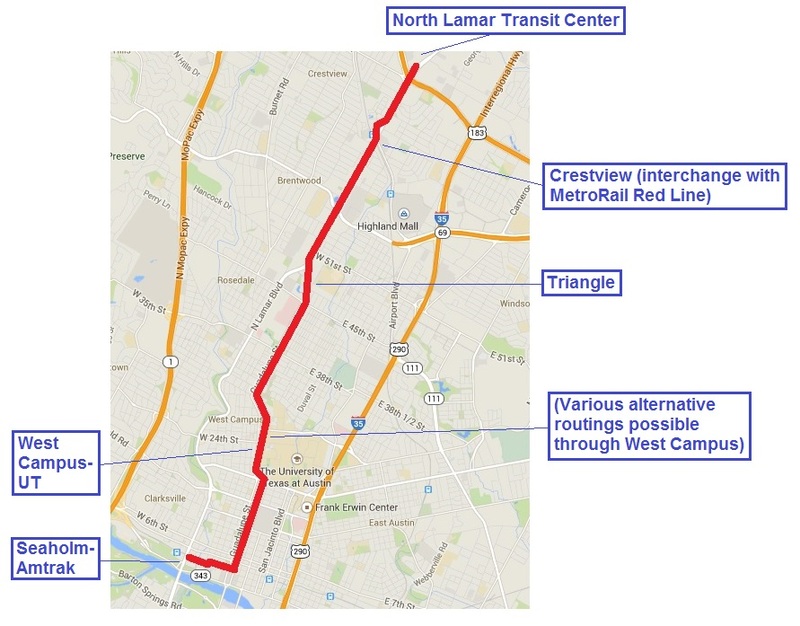 Lately, Project Connect representatives have been trying to claim that their meandering urban rail route proposed from Highland, through Red River and San Jacinto, to East Riverside, somehow addresses the problem of congestion on … I-35. Leaving I-35 at the Highland site to ride a slow train to downtown doesn’t make any sense when, at Highland ACC, you are almost at the Core Area. By the time you leave the freeway, park your car, walk to the station, wait for the train, and ride downtown, you might as well have stayed on the freeway. The I-35 traffic jam actually begins way north of Highland — at the confluence of Howard Lane, North Lamar, and I-35 — and that’s where people would park and ride a train if it were there. But first we have to build urban rail in the right place — up Guadalupe and North Lamar. You have to put your transit station, with park & ride (P&R) access, near the outer end of the traffic jam. You don’t have to be a transportation savant to figure this out. After all, as the public transit planning profession knows very well, P&R facilities need to be provided well upstream of the heavy congestion on a highway facility. There’s very little hope of attracting travelers off the highway if they already have to travel through severe congestion to access the transit station. Project Connect’s claim of “congestion relief” is especially implausible when you further consider that they’re expecting prospective urban rail passengers to slog their way through the I-35 congestion, then, just a few minutes from their destination, to exit the freeway, hassle with parking, wait for a train, and then take a long, slow, sinuous train ride into the Core Area — a route that includes entering Airport Blvd., navigating through mixed traffic on Red River St., then winding through San Jacinto Blvd. and other streets comprising this tortuous “Highland” route. 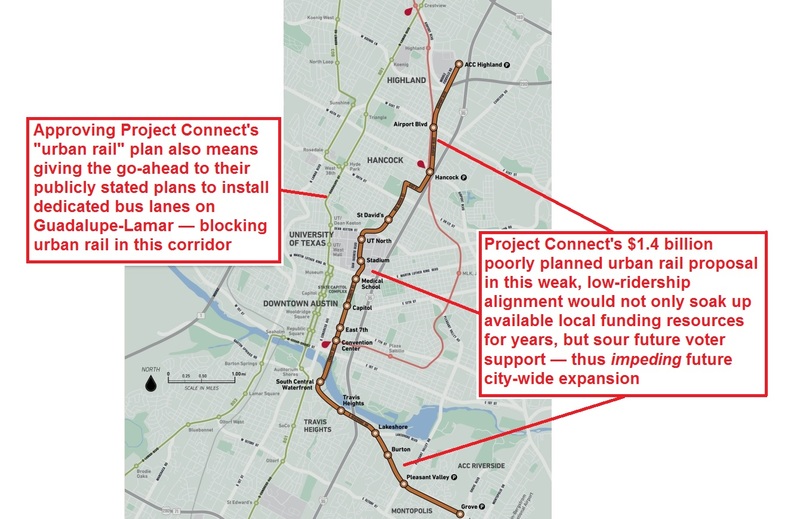 What about the the hints from Project Connect that I-35 may be a major artery that neighborhood commuters themselves, along the proposed “Highland” rail route, supposedly use to reach the Core Area? To believe this speculation, you’d have to accept a vision of about 260 commuters per peak hour from these neighborhoods, currently driving, on average, about 6 blocks to then pack themselves onto a severely congested I-35 (#1 on TxDOT’s list of the state’s most congested roads) to then travel an average 28 blocks into the Core. And doing this when they have at least four other important but much less congested local arterials, including Guadalupe-Lamar, to use instead. Maybe, but this is a scenario that similarly invites powerful skepticism. And is it worth over a billion dollars for an urban rail alignment that would lure perhaps about 65 motorists off I-35 in a peak hour (assuming about 25% modal split for Project Connect’s urban rail)? Instead, as an authentic urban rail alternative to either I-35 or MoPac into the Core Area, you have to travel through the actual heart of the central city and its core neighborhoods on an actual travel corridor where you actually travel to and get off close to your destination. And a lot more of those destinations are within walking distance of Guadalupe-Lamar. That’s why there are 23,000 bus riders daily in this corridor today. The MetroRail Red Line demonstrates this wisdom; after Howard Lane, for passengers riding inbound AM peak trains, it’s standing-room only. And don’t expect a seat outbound in the evening rush until Howard Lane. However, the Red Line’s biggest fault is that while it’s quite long enough, it fails to “connect the dots”. It misses serving the heavy-traffic Guadalupe-Lamar corridor, and bypasses core central-city neighborhoods, the UT campus, the Capitol Complex, and most of downtown (while providing virtually useless service for East Austin en route). 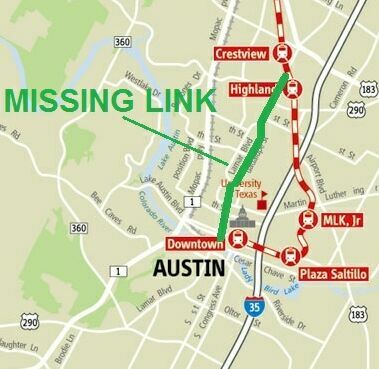 MetroRail Red Line (red) skirts entire heart of central Austin, illustrated by “Missing Link” through Guadalupe-Lamar corridor. 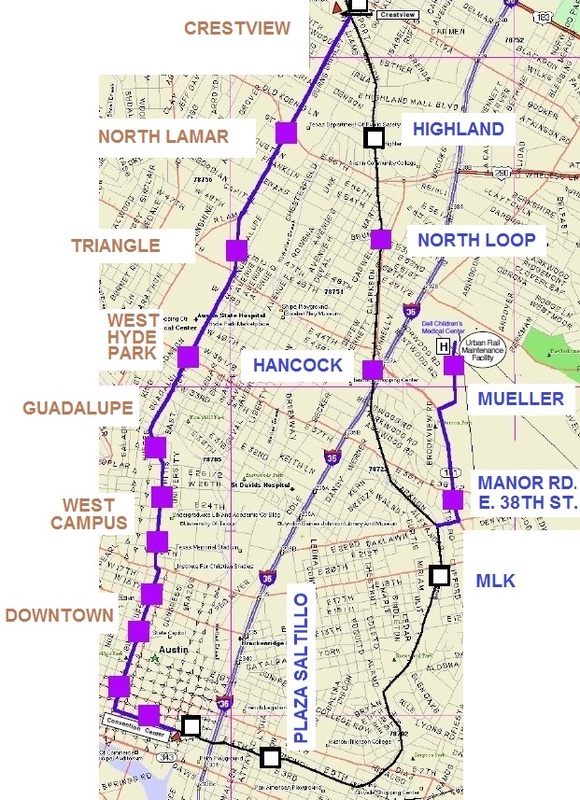 Urban rail would provide the crucial connections to core neighborhoods, UT West Campus, and Capitol Complex missed by MetroRail. Infographic Map by Light Rail Now. In bypassing the heart of the city and the Core Area, the Red Line does indeed miss the big dots, but people hate US 183. Before the freeway to Lakeway and beyond, the bumper sticker read: “Pray for me, I drive 183!” Nothing has changed except that we have a much bigger road, even more traffic, more stress. longer drive times, and only a glimmer of a solution around it. And by far the biggest part of any solution is urban rail on Guadalupe-Lamar. Summing up: Most I-35 travelers are not going to get off the freeway at the proposed Highland station when the real traffic jam starts to form at Howard Lane. The current bus park & ride, Tech Ridge Transfer Center, for AM commuters to the Core, is located where it makes most sense — much further north (upstream) from Highland, at Howard near I-35. Again, it comes back to the real alternative: Urban rail on Guadalupe-Lamar, which could serve a P&R station at the North Lamar Transit Center (upstream of the congestion on North Lamar) — with a clear path for further extension north — and interface with train service to the northwest (initially MetroRail, eventually an extension of electric urban rail) serving outlying P&R facilities such as Howard and Lakeline. 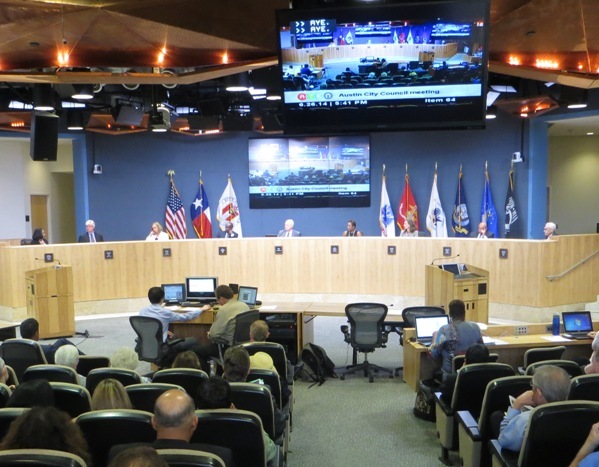 After squelching public input, Austin City Council votes unanimously on June 26th to endorse Project Connect’s Highland-Riverside urban rail plan as Locally Preferred Alternative. Photo: L. Henry. 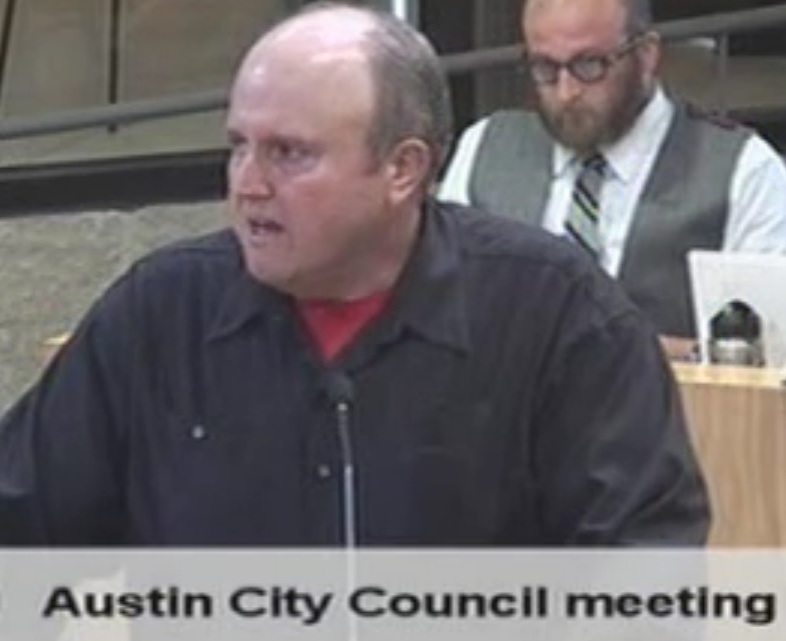 The Austin City Council really doesn’t want to hear from you. They’re tired of having to listen to you at all, and want you to just keep your thoughts to yourself, and shut up. They’re exhausted, they’re bored, they’re busy, and besides, they know what’s best for the city, and for the movers and shakers they deal with, and you’re just getting in the way. This is the message that came across loud and clear at the last Council meeting on Thursday, June 26th, when the Council voted to cut off dozens of speakers prepared to criticize Project Connect’s Highland-Riverside urban rail proposal, allowing only a relative few from “each side”. Trouble is, the side opposing Project Connect’s plan is not a single “side”, but factions representing several major, different viewpoints, from virulent opponents of rail transit altogether, to strong urban rail supporters (such as the sponsors of this blog) who just think the Project Connect plan is a bad idea. No matter — Off With All Their Heads. Time to move on. Prior to the final vote, several opponents of the measure among the handful allowed to speak ditched their prepared remarks and assailed the suppression of democratic speech. We have patiently waited through numerous — through scores — of work sessions where Project Connect has been given unfettered access to your attention. We have patiently waited through scores of briefings that have no citizen communication. And now we’re ready to say: Enough of this. We’re fed up. This plan does not fly. … You need to listen to the citizens of Austin …. OurRail PAC leader Scott Morris denounces Council’s action to constrict debate. Photo: COA video screenshot. This issue cries out for a public hearing. Instead, you subvert the democratic process and proceed with the agenda of special interests. … You should be ashamed. Far from unique, the Council’s stifling of democratic process continues a pattern among various Austin public agencies in recent years of excluding community participation in planning major public projects. Public hearings have almost totally disappeared from the scene for at least a decade or more. For over a decade, Austin public agencies have shut out and gagged the community from authentic participation in planning major projects. And not just the Austin City Council, but Capital Metro and Project Connect itself have been leading offenders. As this blog observed last December, in our post Will Project Connect continue to gag the public? Instead of public participation, it’s been more like public prohibition — exclusion of the community at large from any real role in the process, with Project Connect instead delivering decisions as faits accomplis for public acquiescence rather than an authentic process of involving community members in a bona fide process of actually studying, analyzing, evaluating, and participating in decisions. To present a semblance of “public input”, Project Connect has staged “open houses” (where individuals are allowed to view posters, maps, and other presentations of official decisions) and so-called “workshops” (where small groups clustered at tables are asked to approve predetermined choices via electronic “clickers”). Authentic community meetings, with discussions and comments from the public in a large-group setting, have been avoided like the threat of an infectious disease. The level of insensitivity and lack of respect for the citizen speakers displayed by Mayor Leffingwell marks the darkest day for this lame duck Council. His actions essentially guarantee the defeat of the bond proposition. Austin is a community that places high value on citizen involvement. The Council should have held a public hearing soon after Project Connect announced their final proposal. Today the promise of no limit on the number of speakers was broken, after two days of planning by several groups to come and speak. The resulting lack of trust will contribute to the failure of the bonds. We will look to the new Council with a spirit of hope for respect, transparency and inclusiveness. You are currently browsing the _______________Austin Rail Now blog archives for July, 2014.